At this year’s Mobile World Congress, we were on hand to witness the big announcement of the Nokia X range, a line of smartphones that would run on a forked version of Android made to appear, and function, like Windows Phone. But just five months after February’s MWC, the now Microsoft-owned firm has decided to cease this particular endeavor, with Asha also being scrapped as a part of a shake-up that has seen the Redmond lay off almost 20,000 Nokia staff, and finally, it would seem, the company’s sole focus is Windows Phone. Stephen Elop seemed buoyant in his unveiling of the Nokia X range earlier on in the year, which was intended as a lower-end offering that would lead consumers to go ahead and upgrade to Windows Phone thereafter. For some, though, the idea of running a heavily-modded version of Android instead of, well, Windows Phone, made absolutely sense, and after less than 20 weeks, the plug has been pulled. Instead, Microsoft will channel its efforts into offering more by way of entry-level Lumia devices, which seems a much more logical step to take as the company tries to get the Windows Phone ecosystem off the ground. 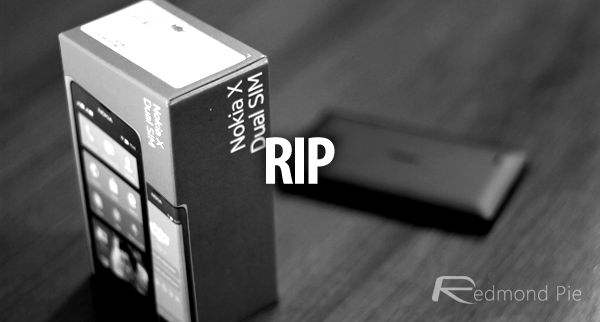 As noted by Elop, former Nokia CEO and now head of devices at Microsoft, the move to dump Nokia X and Asha platforms in favor of Windows Phone will be immediate, and although the company will be “continuing to sell and support existing Nokia X products,” it’s fair to say that Nokia’s short-lived Android enterprise is now dead in the water. Having pushed out three Nokia X models at MWC, the X2 followed in June, but even though this subsequent release suggested that Microsoft was willing to persevere with what was originally a Nokia idea, this is clearly not the case anymore. The 18,000 jobs Microsoft will be axing over the next year just goes to show how focused the company is on competing with the likes of iOS and Android in mobile space, and having dithered about and allowed Apple and Google to become such domineering forces in this market, can ill afford any more failed ventures moving forward. Nokia fans and sentimentalists may be saddened by the news, particularly given the way that Symbian was dumped some years back, but it must be said that from a business point of view, focusing squarely on Windows Phone makes a lot of sense for Microsoft.